Jaclynn sat hunched over on her window seat, her little fingers wrapped around her knees. She watched a brown chunky carriage crawl towards the gates of the castle. Jaclynn sighed as she thought of what that carriage contained. Summer was about to start and the weather was already heating up. Sunlight streamed through the glazed glass window and sprinkles of light were scattered on the rainbow floor. Jaclynn groaned as she looked out at the carriage again and saw that it had paused at the gates. “Your Highness, come along we're to meet Princess Emma at the gates. Do hurry, Princess!” The servant said and Jaclynn sighed and slunk towards the door. She followed the servant through the castle and out to the gates where her parents, the King and Queen of Donuts, stood waiting for her. They were dressed in their most regal attire. Long, orange and turquoise capes, dripping with glaze and sprinkles, were tied around their necks and large pastel donut crowns topped their heads. Jaclynn herself had her own donut dress, it had a yellow top with teal cuffs and the skirt was made of pink and blue sprinkles. She had on her light pink tights and black flats. And, like her mother and father, she had her own Donut crest hanging from a piece of gold string. No one thought anything of their outfits, for this was normal in Dack-A-Woodle-World. They stood at attention as the cookie carriage rolled toward them. It stopped so close to them that Jaclynn could see the details of it. The walls were made out of hardened cookie crumbs, the trim was chocolate, and the top was a huge chocolate chip that curled at the top. The footmen, wearing chocolate colored suits, opened the doors and Jaclynn held her breath. The King and Queen were the first to come out of the carriage. They were followed by a girl who seemed to be twelve and she was trailed by a small girl only a couple years younger than Jaclynn herself. The royal Cookie family stood tall and a servant announced the Cookies to the Donuts. “Their Highnesses, King and Queen of the Cookies, with their daughters Princess Pookie and Princess Emma.” The two families bowed to the other, then the adults joined together and spoke. Jaclynn slipped towards the two princesses and bobbed a curtsy. Jaclynn glanced up at her mop of fluffy brown curls, which had blue sprinkles scattered among them, and nodded her head. 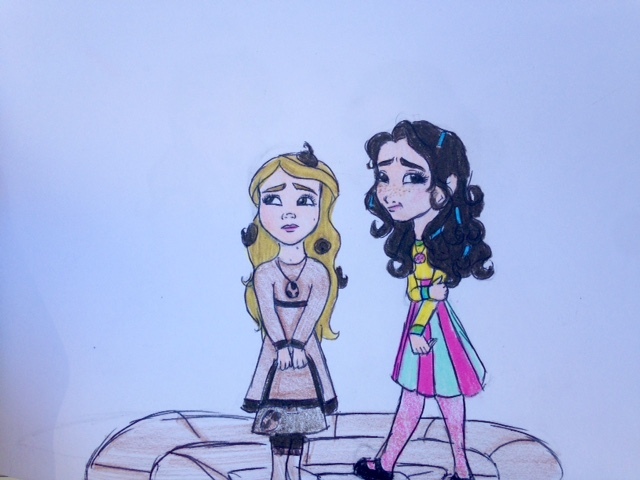 “Thank you,” Jaclynn's eyes wandered to Princess Emma's own bright blonde hair and took in her humble dress. Jaclynn was surprised to see how simple it was. Emma's parents were dressed in their own fancy brown garb, varying in shades, even her sister had on a long, ornate purple dress with deep violet chocolate chips embedded in the skirt, but Emma only had a tan shift that came to her calves and a cookie pendant tied around her throat. They fell back into their uncomfortable silence when the King of the Cookies came to the children with a smile on his face. Jaclynn deflated at his words. She knew it was going to happen, but she still had some hope. But no. Her summer was ruined. There was a thickness in Emma's throat as her parents and sister came to say goodbye to her. “Now, we'll be back at the end of summer. You'll be fine here with the donuts. This is only a demonstration of our trust to the Donut kingdom and Princess Jaclynn seems nice,” the Queen of Cookies explained, smiling. Emma nodded, then said her goodbyes to her family, tears forming in her eyes. She had never been away from her family for more than a couple days, and she hated the thought of being alone for a whole summer with only a girl who seemed stuck up as her company. She watched her family climbed back into the carriage. The cookie carriage rolled away and her throat burned with tears. Emma continued to watch until the carriage became a speck in the distance, then completely vanished from sight. The Donut King and Queen broke the silence. “Come along, Princess Emma! We will show you to your room.” A servant with Emma's bags scurried after them as they began to walk into the immense Donut castle. Emma was struck speechless as she gazed at the splendor of the castle. She could barely make out the regal architecture with such bright, boisterous colors splashed on the walls, ceiling, and floor. Normally, it would have made Emma extremely happy to see such crazy colors, but her mood was darkened with loneliness. The Donuts stopped and turned to look at Princess Jaclynn. “Jaclynn, please take Princess Emma to her room,” the Donut King said and Princess Jaclynn nodded her head and shuffled away. Emma followed her, as did the servant, and they twisted and turned through the colorful castle until Jaclynn stopped in front of two brightly painted doors. “This is your room,” Princess Jaclynn pointed to the door on the right, “and this is my room right next to yours,” She gestured to the left door. Jaclynn reached up to the door knob, twisted, then pushed. The door creaked open and Emma walked into the room. The room was mostly bare, besides a tall dresser and a bed with sprinkles on the sheets. The servant placed her bags on the floor and, with a curtsy to the young princesses, rushed out of the room. Emma lowered her head and stared at her shoes. “Do you want me to leave you to get unpacked?” Princess Jaclynn asked, stepping closer to the open door. Emma noticed her desire to leave, but she didn't want her to go so soon, even though she wasn't the biggest fan of her attitude. She would be all alone then. “Um,” Emma began, trying to think of something to keep her here for, “would you like to do something?” She asked, not knowing what to suggest. “Maybe later. You should get unpacked. I'll let you do that now,” Princess Jaclynn dashed out of the room and Emma heard Jaclynn's door open then shut. Emma sighed and sat on the couch, feeling discouraged. How was she ever going to get through this summer? Ooh this was amazing! I'm very intrigued and can't wait for the next installment. Hey, if you become a writer when you grow up, you can illustrate your own books! That would be really cool. Cute story, Emma! And I absolutely LOVE your art! Great job!